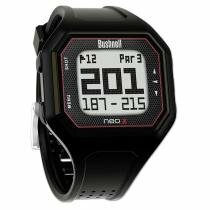 The Bushnell Neo X GPS Golf watch is a convenient device to help you determine the distance you are from the pin and to see what hazards are in play as you approach a hole. It can be bought for $114 on-line but it has been recently replaced with a newer version called the Ion Watch for $150. The main differences with the Ion over the Neo X is that it includes an extra 5000 golf courses worldwide, has a pedometer for counting your steps, has a better designed charging dock and a more comfortable strap. That being said, we were able to purchase the Neo X for $50 so if you can find it on sale you will be able to get pretty much the sdame functionality at a lower price point. So what can it do ? The Neo X comes preloaded with 30,000 golf courses worldwide. If your course isn't in the database you can manually install it by visiting https://bushnell.igolf.com/. It will cost you $35 for a year and you can download 100 courses within that time. You can map your own course free of charge. It is waterproof and comes with a rechargable battery that is good for three rounds of golf or 2 years in non GPS mode. Inside the box you get the watch, the charging cradle and a quick start guide. It may be best to charge the watch prior to use which doesn't take long. The charging cradle is a clip on type that makes contact with some metal pins, it is a bit fiddly but once on is secure enough. It's not the most elegant solution and that is probably why Bushnell changed it in the ION model. The watch's time can be set automatically using the GPS. This is a handy function, especially if you change time zones. You can change it manually of course but that is old school ! GOLF button that starts the process of switching on the GPS, finding your course and starting your game. You can set up a tee-time so it starts up at that preset time and you can change options such as swiching between yards amd metres, auton off function and checking battery status. MENU button let's you see battery status, odomoter (see how far you have walked), alarm, stopwatch, timer, and settings for the time, odometer and sounds. UP/DOWN buttons to move between options and to change hole number manually. Once at the course you press the GOLF button, it starts the GPS and starts finding what course you are at. You select your course and you are ready to go. GPS lock generally takes up to 30 seconds and it is recommended you do it with an unobstructed view of the sky. The watch will then display the hole number you are at in the upper left corner, the par of the hole in the upper right corner, the distance to the centre of the green in the middle and distances to the front and back of the geen at the bottom. You can calculate how long you hit a shot by pressing the GOLF button at your starting point and you can see the distance once you get to your ball. This is useful for checking to see how long your drive is. These codes are a bit daunting at first but once you get the hang of it you are fine. As you switch to another hole the watch generally changes the hole number automatically. I say generally since it didn't always happen and this meant I had to change it manually. No big deal. The ability to change this manually is useful if you are playing a shot gun round and you start at different holes. At any time you can view the total distance walked and the time you have been playing so far. The new ION model also keeps track of your steps and is visually a more appealing looking watch than the NEO X. This is a very important aspect and one I hated when using my cell phone as a golf GPS too. The screen is easy to read even in bright sunlight. It has a backlit display if you are in poor visibility such as at dusk. In my tests it was accurate to within 5 yards. Your yardage (pun intended) may vary depending upon the course and GPS strength. I found that this to be good, even on a course I was familiar with. The time it takes to change the yardage display was quite quick too, perhaps a second or two delay at times but nothing off-putting (OK, I must stop using golf puns). Let's face it, you are not going to win any fashion awards wearing this. It looks like a digital watch from the 80's. This and the poor comfort will not want you to wear this as your daily watch. The rubber strap is stiff and if you don't have it just right it will be too tight or even worse be loose which is annoying when you are taking a swing. It also gets a bit sweaty too. It is a shame that the watch band is not user replaceable as that would have made it more bearable to where. It is also a pity that the watch itself is not styled like a regular fashion watch to encourage you to wear it all the time. In my tests the battery did not show any depletage in two 9 hole rounds one week apart. This is very good. It doesn't keep track of how many shots you are doing. I would like to see a function that keeps track or your shots as well as a number of opponents. It doesn't count your steps either but I don't see this as a deal breaker as you won't really be wearing this every day. Despite its shortcomings the watch does its most important function of giving you distance and harzard information well. This information is easy to see and the watch is easy to use. It has good battery life so there is no fear that you will lose functionality mid-round. It has an auto off feature which is useful in case you forget to turn the GPS off manually. It charges up quickly too. It's not a very comfortable watch and looks kind of geeky, but is much better to use than those telescope distance devices and in my opinion a cell phone app as those are hard too see in bright light and is a hassle getting it out of your pocket all the time. As for value for money , $120 is a fair price. I wouldn't pay any more - I would swing (oh no, I did it again !) for the newer ION model at $150 which looks more comfortable, has a better charging mechanism, looks better, has more courses preloaded and tracks your steps.